Fasting–even brief, sporadic fasts–not only helps you lose weight, but reduces your risk of age-related diseases like cancer and diabetes. 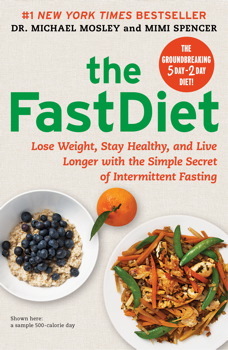 From the bestselling book, The FastDiet: Lose Weight, Stay Healthy, and Live Longer with the Simple Secret of Intermittent Fasting. The fact that prolonged starvation is clearly very bad for you does not imply that short periods of intermittent fasting must be a little bit bad for you. In fact the reverse is true. This point was vividly made to me by Dr. Valter Longo, director of the University of Southern California’s Longevity Institute. His research is mainly into the study of why we age, particularly concerning approaches that reduce the risk of developing age-related diseases such as cancer and diabetes. I went to see Valter, not just because he is a world expert, but also because he had kindly agreed to act as my fasting mentor and buddy, to help inspire and guide me through my first experience of fasting. Valter has not only been studying fasting for many years, he is also a keen adherent of it. He lives by his research and thrives on the sort of low-protein, high-vegetable diet that his grandparents enjoy in southern Italy. Perhaps not coincidentally, his grandparents live in a part of Italy that has an extraordinarily high concentration of long-lived people. As well as following a fairly strict diet, Valter skips lunch to keep his weight down. Beyond this, once every six months or so he does a prolonged fast that lasts several days. Tall, slim, energetic, and Italian, he is an inspiring poster boy for would-be fasters. Most of the early long-term studies on the benefits of fasting were done on rodents. They gave us important insights into the molecular mechanisms that underpin fasting. In one early study from 1945, rats were fasted for either one day in four, one day in three, or one day in two. The researchers found that the fasted rats lived longer than a control group, and that the more they fasted, the longer they lived. They also found that unlike perpetually calorie-restricted rats, the fasted rats were not physically stunted. Since then, numerous studies have confirmed, at least in rodents, the value of fasting. But why does fasting help? What is the mechanism? Valter has access to his own supply of genetically engineered mice known as dwarf or Laron mice, which he was keen to show me. These mice, though small, hold the record for longevity extension in a mammal. In other words, they live for an astonishingly long time. The average mouse doesn’t live that long, perhaps two years. Laron mice live nearly twice that, many for almost four years when they are also calorie restricted. In a human, that would be the equivalent of reaching almost 170. The fascinating thing about Laron mice is not just how long they live, but that they stay healthy for most of their very long lives. They simply don’t seem to be prone to diabetes or cancer, and when they die, more often than not it is of natural causes. Valter told me that during an autopsy, it is often impossible to find a cause of death. The mice just seem to drop dead. Valter’s work is focused on trying to figure out how you can go on driving as much as possible, and as fast as possible, while enjoying life. He thinks the answer is periodic fasting. Because one of the ways fasting works is by making your body reduce the amount of IGF-1 it produces. Is it possible to eat normally—five days a week—and become slimmer and healthier as a result? Simple answer: yes. You just limit your calorie intake for two nonconsecutive days each week—500 calories for women, 600 for men. You’ll lose weight quickly and effortlessly with The FastDiet. Dr. Michael Mosley is the #1 New York Times bestselling author, with Mimi Spencer, of the FastDiet published in over thirty-two languages around the world. He is also coauthor, with Peta Bee, of FastExercise and wrote the foreword for the FastDiet Cookbook by Mimi Spencer and Dr. Sarah Schenker. Dr. Mosley trained to be a doctor at the Royal Free Hospital in London before joining the BBC, where he has been a science journalist, executive producer, and, more recently, a well-known television personality.